The Drotos Ryals Group at Bosshardt Realty Services is pleased to announce the successful sale of a 5,037-square foot office to Doug Johnson of Johnson and Fletcher Insurance and Management Solutions. The building in located just off of NW 43rd Street in the heart of the Millhopper office market (4127 NW 27th Lane) and will serve as a central and convenient location for the firm’s customers and employees when they make the transition in Q4 of 2017. Doug took over his ownership role of the agency in 2013 and has continued its long track record of success. The acquisition of the new office will allow for added efficiencies and growth in the coming years. As a Gainesville native and former University of Florida and NFL quarterback, Doug is also a proud supporter of the Boys & Girls Club of Alachua County through his annual charity fishing tournament, Reeling for Kids which enabled him to raise upwards of over $1,000,000 over the past 14 years with 2017 proceeds estimated over $200,000 alone! 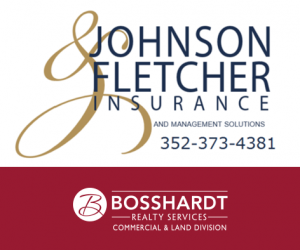 We wish Johnson & Fletcher Insurance continued success and growth in their new location. For all of your commercial real estate needs, please call the Drotos Ryals Group today at (954) 551-9846.